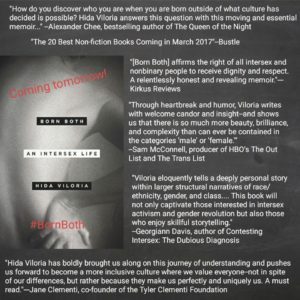 Hida Viloria | Last chance to pre-order Born Both! Last chance to pre-order Born Both! I’ve never had a baby, but this project gestated longer than one, and I’m about to give birth! Please support intersex voices and people in society by pre-ordering a copy today before it hits stores tomorrow. ← Born Both listed as one of the Culture Essentials for March!